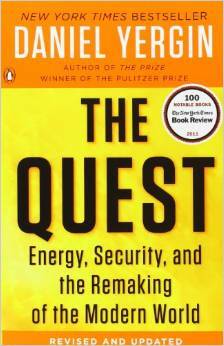 The Quest: Energy, Security, and the Remaking of the Modern World by Daniel Yergin. Whew. There is some hope. At least, that’s my interpretation of it. I am a glass half-full type of person and that’s my view of it. I may be wrong. I’ve been wrong before. This book gives me hope. Its message is simple and positive. It convinced me, through painstaking research, interviews and a recounting of recent history, that human beings will survive. Somehow, through some miracle, In some unpredictable, unknowable way, human kind will make it through. It is worth reading for that hope alone. The list of major events and their effects on human efforts to harness available energy is impressive. And it all happened within the span of a lifetime. Desert Storm, the collapse of communism, OPEC and Venezuela’s actions, the world recession and, of course, 9/11, the accidents at Chernobyl and Three Mile Island, Hurricanes Katrina and Rita, the Japanese tsunami and the Arab Spring. All of them and others are on the list. Daniel Yergin, a Pulitzer Prize winning writer, lays out this book in six sections. Part 1 is called The New World of Oil and is made up of ten chapters which deal with events which range from the Gulf War to the rise of China. The definition and examples of “the Dutch Disease” and “Petrostate” are contained in these chapters as well as an accounting of the creation of the “Supermajors” (giant companies like ExxonMobil) and their influence. Part 2 is called Securing the Supply and includes chapters eleven to sixteen. They deal with unrest in the Middle East, the uncertainty of Venezuela, the threats from Iran and the history and currency of “energy independence” from American and Chinese points of view. Part 3 is called The Electric Age and includes chapters seventeen to twenty which demonstrates that “the history of the oil and gas industry, as with virtually all industries, is one of technological advance”. It is here that human progress is tied inexorably to electricity which is produced, in large part, by burning carbon. Part 4 is called Climate and Carbon. It includes chapters twenty one to twenty-six which tell the story of how climate change went from the study of a few curious scientists climbing around glaciers to the main focus of the Kyoto Conference to the beginning move toward a carbon market and a cap and trade system. Those who object to “trading pollution” are reminded that the internet exists because of electricity. Part 5 is called New Energies and includes chapters twenty-seven to thirty-two in describing alternatives to coal and oil such as wind, sun and other “Renewables”. Part 6 is called Road to the Future and includes chapters thirty-three to thirty-five. The last chapter (35) is called The Great Electric Car Experiment and the Conclusion is called “A Great Revolution”. Who could have known that last year China bought more new cars from American manufacturers than Americans did? And that 70% of all new housing in Japan will have to have solar panels on the roof by 2020? And that grow your own biofuels and electric cars (Thanks to Tesla) are well on their way to commerciality? On November 12, 2014 China and The US signed an agreement to increase their use of “renewables” to 20% by 2030. Even if it is for show, as some say, it is a small, faltering, baby step in the right direction. When those two behemoths move, they get everyone’s attention. The landscape won’t change appreciably until the 2030’s. Coal, oil and natural gas will generate most of the power and car engines will become more efficient. When the people born now are sixteen years old, the 2030’s will be beginning a new age of energy and power generated by human beings with less pollution of the atmosphere with carbon and other waste. Here you can only hope that it’s not too little, too late. As Yergin demonstrates in this book, huge events like the Japanese tsunami and the Arab spring are as unpredictable as Hurricane Katrina and the world recession in their effects on the energy picture. Yet the genius of human beings always finds an answer. Unimagined solutions to our present problems are waiting out there for us to discover them. We might not find them but someone will. This is not a book that encourages us to maintain the status quo. It is worth reading because it delineates the history of human progress and points out the many cases where people were too dedicated or determined to give up until they discovered solutions or partial solutions to our energy problems. No matter how humans try to see what the future holds, they can never quite get it right but somehow, in an unexpected way, they find the solution to the immediate problem and discover a way to attack the bigger problems. The Quest is a meticulously researched book which gives the reader a refreshing, unfamiliar, positive point of view on the big picture. But that’s just my glass half full interpretation of it. As a Canadian that’s the only way to look at it. It also Includes Acknowledgements, Photos and Photo Credits, Notes on each chapter, a Bibliography and an Index.